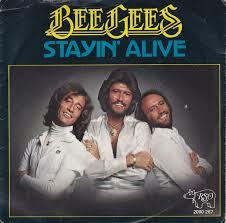 The Bee Gees’ ‘Stayin’ Alive’ joined an elite club of 8 songs which had spent 8 or more weeks at number 1 as it clung on to the top spot for another week. They also had the number 2 spot with ‘Night Fever’ and this was the 8th time that an act had the top 2 spots. The Bee Gees’ had made up 5 of those 8 times with The Hollies, Pussycat and The Sweet each having 1. A bit of a spoiler alert, but this would be the last time we would ever see an act having the top 2 spots on the chart. Boney M’s ‘Rivers Of Babylon’ was the climber of the week with an 11 place jump from 15 to 4. This was the 32nd time a song had climbed 11 or more in a week. This was the second time we saw a biggest climber of 11 places and no other star raters. The record to date was 10 October 1975 when the biggest climber was Typically Tropical’s ‘Barbados’ which jumped up 12 placed and the next best climb was 3 places. On the falling front it was Supercharge’s ‘I Think I’m Gonna (Fall In Love)’ which dropped 7 from 12 to 19. We bid farewell to Emmylou Harris’ ‘To Daddy’. It had only been with us for 2 weeks and peaked at 19. This short adventure in our charts would be all that Emmylou would manage. Also going was the song that was the oldest on last week’s chart and that was Wings’ ‘Mull Of Kintyre’ which had enjoyed a run of 23 weeks, spending 5 of them at number 1. There would be more to come from Paul McCartney and his band. The new oldest on the chart was The Bee Gees’ ‘How Deep Is Your Love’ which was enjoying its 22 week in the top 20. This was their 4th hit to be the oldest in the charts and they were the 6th act to see this many. Two others (Cliff Richard and The Beach Boys) also had 4 while The Troggs had 5, The Hollies 6 and Tom Jones led the way with 7. The first of our new entries came crashing it at number 9 which was the second highest new entry for a local song, 2 places lower than Charisma’s debut at 7 with ‘Mammy Blue’. It was also the 11th song to arrive in our charts at position 9 or higher. Only 1 other local song would manage this. The newcomer was Peter Lotis’ English version of the theme tune to the popular kids cartoon show on TV, ‘Heidi’. Lotis had last been on our charts in September 1973 and the 4 year, 8 months and 18 days since ‘Sunday Girl’ was in the charts was the 9th biggest gap to date between local hits. With Gene Rockwell’s 411 weeks being the longest absence to date for a local act. We had now seen 35 occasions where an act had experienced a gap of 200 weeks or more between hits and Peter Lotis was the only one to appear on that list twice. The cartoon series of ‘Heidi’ was first released in 1974 and was produced by Japanese animation company Zuiyo Enterprises. It was based on an 1880 novel by Swiss born Johanna Spyri. In Europe a version of the theme song by Gitti und Erica would go to 4 in Germany, 8 in Holland and 18 in Austria. At 46 years, 11 months and 12 days old, Lotis became the all-time oldest local act to chart of the acts whose birthdates are readily available. He was the 16th oldest overall. He took over the local record from Al Debbo, being exactly 400 days older than Debbo was when he set the record. The other new entry was Luisa Fernandez’s ‘Lay Love On You’. Hailing from Spain, Fernandez’s hit was the 5th by an act from that country to chart with 2 from Baccara and 1 each from Miguel Rios and Los Bravos being the others. Luisa was a tender 17 year old when her song became a hit, going to 7 in Germany, 5 in Austria, 4 in Holland, 7 in Belgium and New Zealand and even making 31 in the UK. Spain joined Italy in tied 13th place for number of hits by a nation. Fernandez was the 4th youngest woman to chart with Lena Zavaroni, Gwynneth Ashley-Robin and Marie Osmond being the ones who had charted at a younger age. Once again the caveat that this is based on those that I have been able to find ages for applies.